If you are in the market for a used car, you simply cannot afford not to use AutoCheck buyback protection. Used vehicles often come with a myriad of uncovered mechanical issues or past problems. Imagine driving down the road in your newly purchased used car and, all of a sudden, you break down and are at a dead stop in the middle of nowhere. Upon visiting a mechanic, you may learn that your vehicle is suffering from any number of problems, things you probably wish you had known prior to making your purchase. This is where AutoCheck buyback protection comes in. By using this service, you can “insure” your purchase, and be certain that if you run in to problems, you will be fully compensated for the cost of the car. AutoCheck is a VIN number lookup service which aids car buyers in the used vehicle market. During the course of shopping for used cars, customers can utilize AutoCheck’s history reports not only to verify the claims made by the seller, but to be sure that the car is free of major issues. In essence, you can think of AutoCheck as a “credit report” on a used car. If the vehicle has ever been in accident, experienced significant damage, or undergone major repairs, an AutoCheck report can dig it up for you. By purchasing an AutoCheck vehicle history report, buyers are informed of every issue present with a used vehicle. The report includes a wealth of information, including whether or not the vehicle has ever been in accident. Should that be the case, AutoCheck even displays what type of accident it was and the point of impact on the car, as well as the extent of damage sustained. Title checks are another feature which help to verify the car’s accident history. Other facets of a used car such as water damage and odometer readings are also verified in the report. It is easy to see how utilizing an AutoCheck report can offer peace of mind when it comes to buying a used car. One additional feature of this service is AutoCheck buyback protection. This service insures your purchase, as AutoCheck offers to buy back any used car you purchase which has issues not identified in the report. Once you run a report on a vehicle VIN number, you are automatically eligible for AutoCheck purchase protection, so long as the car does not have any known issues. The buyback feature is AutoCheck’s way of guaranteeing their work. 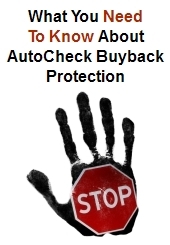 Should you choose to invest in AutoCheck buyback protection, you are eligible to receive up to 110% of the car’s value, plus $500 in aftermarket accessories, in the event that a problem is discovered that AutoCheck failed to identify. AutoCheck buyback protection is different than other buyback guarantees in two important ways. First, AutoCheck is one of few vehicle history reporting agencies which offers buyback on aftermarket items. Second, the AutoCheck purchase program can never be cancelled by the company, unlike some agencies which retain the right to cancel the guarantee at their convenience. Countless customers have used AutoCheck buyback protection with resounding success. Thanks to AutoCheck’s detailed reports, buyback protection is rarely needed, although it is certainly an excellent safety measure to take when buying a used car. Often times, used cars are bought from owners who themselves may not even be aware of the vehicle’s history. By utilizing AutoCheck VIN number lookup reports, you can be sure that you are getting the most comprehensive history on the vehicle. And, of course, AutoCheck buyback protection is the ultimate in insuring your vehicle purchase. If your used car presents issues not reported by AutoCheck, they buy the car from you, no questions asked.